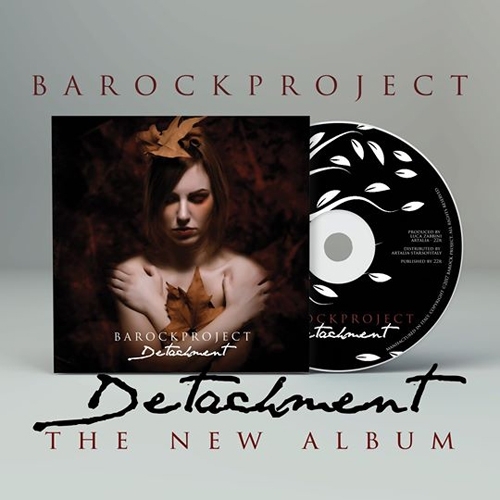 On 20 March 2017, Barock Project will release their sixth album, a CD entitled DETACHMENT. The fifth studio album for the Italian band, opening their second decade of history in a steady rise into the prog symphonic rock world. Following the 3 reprints of Skyline (2015) and the double live CD Vivo (2016) acclaimed by international press and sales in 40 countries, the band delivers a brand new set of music after a full year of studio sessions started as soon as former vocalist Pancaldi left Barocks. Thirteen tracks that take the listener on a magical musical tour around rock, symphonic, jazz, folk, metal, electronic and even distant hints of oriental and flamenco, led by the versatile instrumentalist Luca Zabbini, this time also lead vocalist and unstoppable composing soul of Barock Project. DETACHMENT is an album far more straight and essential than previous, less muscle and more substantial elegance, a choice made for a communicative reason that is perhaps more directed to the band itself. As announced by Zabbini: "I started so many years ago writing music to feel good, I think this is the main reason why I do it. And at times you realize that you can do very well without writing long and complex suites, basically forced by the fact that this music labeled "Prog‘‘ must necessarily have all these features to be it. But I think that this, too, can be considered kind of a ‘‘Detachment‘‘ ... and so I felt free to write more easily. I always thought that if the music I write comes from within then it is honest. And if I‘m honest with myself, I‘m happy." The musical approach stays elegant, serious but communicative, respectful of traditions but in line with contemporary music evolution. Very special Guest in DETACHMENT, the British vocalist Peter Jones (Tiger Moth Tales, Camel, Red Bazar, Colin Tench project...) signs three beautiful lyrics and performs his warm and magical singing on two tracks. Luca Zabbini – piano, keyboards, acoustic guitars, lead vocals Eric Ombelli – drums Marco Mazzuoccolo – electric guitars Francesco Caliendo - electric bass Peter Jones - Lead vocal on "Broken" and "Alone"